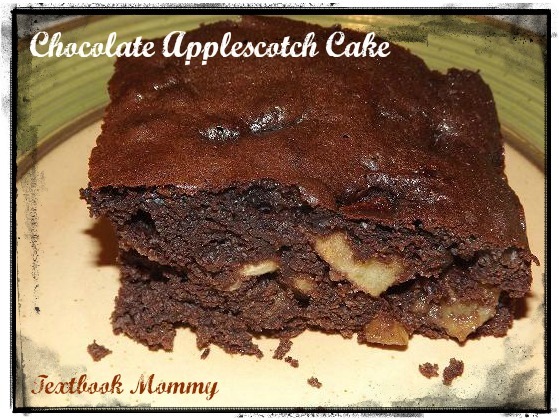 This recipe is one I concocted today as a result of wanting a tasty treat! I wanted to use up the rest of the Granny Smith apples I had, so I took inventory of what I could throw together. This cake turned out to be a huge success at my house and I'm glad I wrote it down as I went along because I will be making this again for sure! There is no frosting in the directions because this cake is so moist and flavorful, you really don't need one. The chunks of diced apples inside give you a sweet and slightly tart surprise that go well with the chocolate. I served this up while it was still warm and it was perfect. 1) Peel and dice up your Granny Smith apples. 2) In a bowl combine your apples, cake mix, water, oil, eggs, and pudding mix. Stir well. 3) Grease a 13 x 9 pan and pour in your cake mix. 4) Bake at 350 degrees for 32-37 minutes.